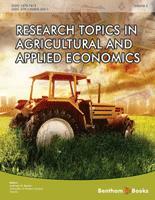 Volume 2 of the E-Book Series “Research Topics in Agricultural and Applied Economics,” edited by Professor Anthony Rezitis provides a number of papers that are excellent examples of advanced empirical work applied to relevant problems. Readers, in particular applied economists, will find the work presented useful for its illustration of how to apply advanced techniques such as Almost Ideal Demand Systems and conjoint analysis to real world problems. The results of the analyses presented also will prove useful to those in the applied world of agricultural economics. The topics addressed are quite relevant ranging from modeling trade in virgin olive oil to valuing attributes of wine. This collection provides a valuable contribution to the continuation of applied economics in providing insight to relevant problems. The aim of the e-book series of Research Topics in Agricultural & Applied Economics (RTAAE) is to publish high quality economic research applied in both the agricultural and non-agricultural sectors of the economy. Subject matter areas of this e-book series include, among others, supply and demand analysis, technical change and productivity, industrial organization, labor economics, growth and development, environmental economics, marketing, business economics and finance. By covering a broad variety of economic research topics, this e-book series is addressed to a wide spectrum of academic agricultural and applied economic researchers and scientists but it could also be useful to industry specialists and government policymakers. Chapter 1, entitled “The Italian demand for imported virgin olive oil: a Threshold Almost Ideal Demand System Approach”, examines the import demand for virgin olive oil in Italy. The methodology used is based on the specification of a Threshold Almost Ideal Demand System (TAIDS) in which special attention has been paid to the stochastic properties of the series involved. Chapter 2, entitled “Food Crisis: did agricultural prices rise faster than they fell?”, examines the issue of asymmetry between downward and upward price transmission by investigating a sample of small wheat importing countries. It uses time series models which allow for asymmetries – namely regime switching co integration techniques – to examine whether the international price spike and its subsequent decline have been transmitted to domestic markets to the same extent. Chapter 3, entitled “New trends in consumer needs: functional foods in the European market”, offers an overview of the functional food (FF) market in Europe and ascertains the opportunities for further expansion of this segment. Consumer behaviour towards FFs was analyzed through a quantitative survey conducted on 400 Italian food shoppers. Chapter 4, entitled “Consumer knowledge of animal welfare standards”, analyzes consumer knowledge of the welfare standards of laying hens based on the results of a direct survey on 300 Italian food shoppers. The findings highlight important market opportunities and policy implications. Chapter 5, entitled “Consumer geographic segmentation and valuing attributes of wine in supermarket: An Hedonic Approach”, determines the relevance of the main attributes for wine, in some geographic areas in supermarkets of Santiago, Chile. Brands and ranking appear to be relevant characteristics for wine value in all segments. Chapter 6, entitled “Territory image and notoriety as sources of equity in the wine market”, investigates which sources of brand equity could endow the product with a higher differentiation by studying five Spanish collective brands: Rioja, Valdeorras, Ribeiro, Rias Baixas, and Ribera de Duero. A panel of 296 consumers assessed the dimensions of brand equity for each of them. Chapter 7, entitled “Means-end chain analysis of food products with origin quality labels: an application to wine with designation of origin”, analyzes relationships between origin-based differentiation features of food products and the personal values on which consumers base their purchase decisions by applying means-end chain methodology through an interviewing technique known as laddering. Chapter 8, entitled “Is there a future market for Genetically Modified Food? An analysis from southern Spain consumer preferences”, examines consumer behavior regarding Genetically Modified (GM) food in southern Spain based on a survey of 448 people. Some questions regarding to food safety and quality are raised in order to know consumer’s concerns and the Conjoint Analysis (CA) method is applied to estimate consumer’s preferences in relation to a hypothetical genetically modified (GM) cornflakes cereal, as an alternative of real product. Chapter 9, entitled “Global crisis and agricultural public spending in Kenya: a SAM Multiplier Approach”, focuses on Kenya with the purpose of understanding the role of public spending in the primary sector in addressing the current food crisis and in contributing to overall economic growth and alleviating poverty and food insecurity according to the first Millennium Development Goal. Chapter 10, entitled “Measuring relative efficiency of bank branches: the case of the Agricultural Bank of Greece”, investigates the relative efficiency of a sample of 19 bank branches of the Agricultural Bank of Greece for the years 2002 and 2003 by using the Data Envelopment Approach (DEA). Chapter 11, entitled “Measuring labor productivity and market viability of rural tourism activities in Japan”, evaluates diversified rural tourism activities from the perspectives of economic viability and endogenous utilization of rural resources and investigates labor productivity of eight rural tourism activities. It finds that rural tourism in this country is undersupplied at a social optimal level. Department of Economic Studies "S. Vinci"